SALT LAKE CITY (AP) Golden State Warriors coach Steve Kerr was disgusted by his team’s effort in a 30-point blowout on Tuesday night. 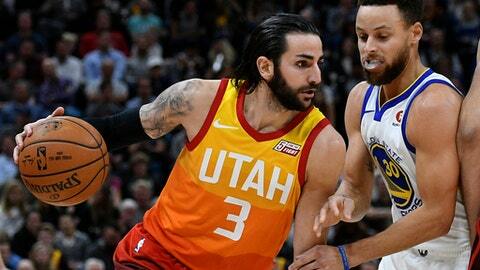 For the Utah Jazz, it was the best win of a disappointing season. ”I saw one team get their (tail) kicked,” Kerr said. ”Our hearts weren’t in it. At this level, if your heart’s not in it, I don’t care how much talent you have. You’re going to lose. … It happens. It’s the NBA. It’s a long season. ”Shooting is an equalizer,” Jazz coach Quin Snyder said. ”I thought when we came out, Joe Ingles set the tone with the confidence with which he shot the ball. ”It is another example of players being kind of pigeonholed into this idea of loyalty and sacrifice and all that kind of stuff when it comes to signing deals and where they want to play and free agency,” Curry said. ”It’s not reciprocated on the other end consistently. There are examples that it is and there are healthy relationships around the league, for sure. Not to sound too negative, but I think there is kind of a consensus that you have to make decisions as you see fit as an individual. The Jazz debuted their new ”City Edition” uniforms with a corresponding court layout. The jerseys gradually fade from a bright gold around the shoulders, to orange around the midsection to a deep burgundy at the bottom of the shorts that represents the red rocks and canyons in southern Utah. The court also featured the color pattern around the edges and in the ”Utah” logo at center court. The floor also featured an image of the Delicate Arch from the Arches National Park.